My parents were the type of ‘progressives’ who spanked their children but prefaced each punishment by asking us how many taps on the palm we thought our indiscretions deserved. I felt it obvious to always start with ‘1’ and negotiate upward if necessary. Peter's default, however, was ‘3.’ Because of this (and so many other reasons), he endured far more taps than I did. Peter claims he was once told that he couldn’t start with 1. I claim he’s simple. Policymakers use the behavioral economics of defaults to direct our behaviors. Rather than constrain our choices, defaults capitalize on our readiness to accept the status quo. Consumers could refuse a default, but most find it easier just to go along with it. One oft-cited example of this is organ donor status. Countries like Spain, where organ donation is the default (and an ‘opt-out’ is required), have much higher participation than countries like the US, where an opt-in is required. Automatic generic substitution is another good example. Generic substitution policies take advantage of what we’ve learned about the benefits of generic medications and the power of defaults. The policies save payers and patients money by substituting prescribed brand name medications for bio-equivalent generics unless otherwise requested. A 2010 study led by the brilliant Dr. Will Shrank* of Harvard Medical School examined the adoption of the new generic cholesterol drug simvastatin and its brand-name equivalent Zocor after Zocor’s patent expired in June 2006. In comparing states that required patient consent to switch patients from Zocor to simvastatin (default no substitution) and those that did not (default generic substitution), the study found that default substitution states saved $15.35 per prescription in the first 3 months after patent expiration. Of course, patient choice is also important. 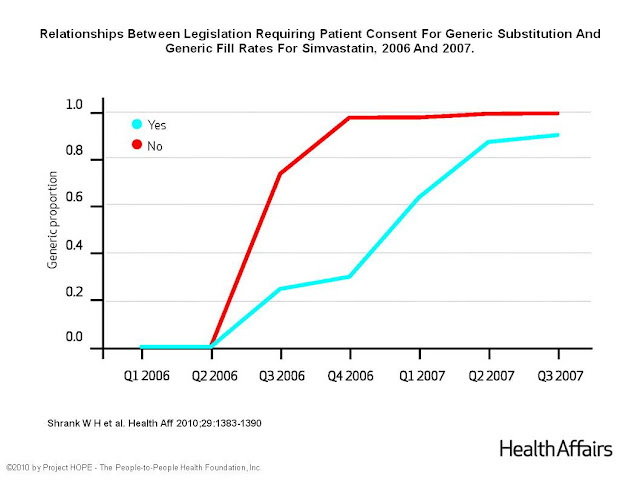 The study reveals that after a year, the rates of generic adoption between states with and without consent laws converge, meaning that the majority of patients do eventually choose generic simvastatin, but those in states without default substitution took longer to choose simvastatin. That time was costly. Had the policies been in place and the wait averted, Medicaid could have saved $19.8 million on simvastatin alone. The Red Line (default substitution) states had higher rates of generic adoption than the Blue Line (default no substitution) states. The lines begin to converge in 2007, but the 5-quarter gap cost $19.8 million. Policy Implication: Defaults can shape consumer behavior toward desired outcomes without compromising choice. *Disclaimer 1: I think Will is brilliant because I work with him and have personally witnessed his brilliance. I am not paid to endorse him and do not speak for him. *Disclaimer 2: In my younger, wilder days, I wrote a longer piece explaining the details of Will’s paper for a health advocacy blog. You can find the post here. Thanks for the article. I do have thoughts! Let me first refer you back to the 1st post that mentions generics (http://isthispublichealth.blogspot.com/2012/08/they-all-look-same-to-me.html), specifically, the 2 review studies cited (http://www.ncbi.nlm.nih.gov/pmc/articles/PMC2713758/?tool=pubmed and ttp://www.ncbi.nlm.nih.gov/pubmed?term=PMC3056509). It is true that there are often anecdotes of patients experiencing adverse events from switching to generic medications in the popular press, but it is often unclear whether it is the switching process itself or the actual medication that is responsible. Moreover, as the studies demonstrate, on the whole, these systematic reviews (which aggregate information across many peer-reviewed studies) found generic medications, even those for seizures, to be just as effective as generics. The switching process is not to be taken lightly, and, especially for medications like those for seizures, should be carefully monitored and calibrated by a physician, but as the study says, "the available evidence does not suggest an association between loss of seizure control and generic substitution of at least three types of AEDs."